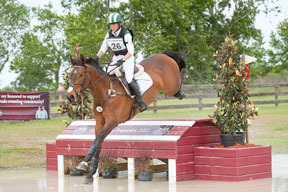 Nicole Parkin of Orangeville, ON, led the large contingent of Canadians competing at the Ocala Horse Properties International Three Day Event in Ocala, FL, April 12-15, 2012 with a win in the CCI 2* division. Sitting in third place after dressage on a score of 43.70, Parkin and Lexus, Gail Gendrie’s 12-year-old Hanoverian mare went on to perform a fault-free ride over the cross country course, designed by Canadian Jay Hambly, and added just one show jumping rail, for four faults to their score moving them into the winning spot on a final score of 47.70. Finishing in fourth place in their first CCI 2* competition was Young Rider Sable Giesler of Powassan, ON, riding her own Evil Munchkin, an 11-year-old Holsteiner gelding. Tied for 10th place following dressage with 55.30, they added only two cross country time faults to finish with a final score of 57.30. The pair were individual silver medalists at the 2011 North American Junior Championships. Cody Sturgess of Port Perry, ON, and the rider’s own 11-year-old Canadian Thoroughbred mare, Imperial Melody, finished eighth with 68.80. Riding her own 13-year-old Canadian Sport Horse mare, Watson’s Shelbreen, Frankie Simpson, of Orangeville, ON placed in 11th place with a score of 73.60. Kaleigh Holland of Kelowna, BC, with her own True Dynamite, a 10-year-old Thoroughbred mare, placed 13th overall. Erin MacDonald of London, ON, riding her own Tobaiz, a 10-year-old Canadian Sport Horse gelding, was 15th. Rounding out the Canadian entries in the CCI 2* division was Hilary Popiel of Carleton Place, ON, riding Grey Max, Paul Popiel’s eight-year-old Canadian Thoroughbred gelding, in 18th place. Samantha St. Jacques originally from Vancouver, BC, now residing in Anthony, FL, was top was Canada’s top placed entry in the CCI 1* aboard Jaeda the eight-year-old Canadian Thoroughbred mare owned by Gregory Paull. The pair finished on their dressage score of 52.5, which was good for fourth place. Hawley Bennett-Awad of Langley, BC and Demello, Megan Lepper’s eight-year-old Oldenburg gelding, Bennett-Awad added only a rail, for four penalties, in show jumping to their dressage score of 53.10, to finish 11th with 57.10. Right behind Bennett-Awad on the leaderboard in 12th place was Jessica Phoenix of Cannington, ON, riding her own Patras VR, an 11-year-old Canadian Trakehner gelding on a final score of 58.70. In 14th spot was Canadian Lesley Grant-Law riding What Law, the rider’s own seven-year-old Irish Sport Horse gelding. Other Canadians completing the CCI 1* division within the top thirty include Stephanie Hodge and Pen Pal (17th), April Simmonds and Impressively Done (19th), Phoenix and A Little Romance (22nd), Parkin and Shotgun Express (26th). Robin Walker, of the United States, claimed the CCI 1* win aboard Someday Never Comes. The next stops on the Canadian eventing calendar are the CCI 4* Rolex Kentucky Three Day Event April 26-29 in Lexington, KY; the CCI/CIC 3 Jersey Fresh Three Day Event May 10-13 in Allentown, NJ; and the CCI/CIC Bromont Three Day Event June 7–10 in Bromont, QC.